The Quest for Height: Grow Taller | Increase Height | Bone Size: Does LSJL put you at risk for osteophytes? Many have noticed an increase in epiphyseal width but only a small increase in bone length after LSJL loading. The two methods of increasing epiphyseal width are osteophytes and endochondral ossification. Endochondral ossification is growth from within and what we are trying to induce with LSJL. The epiphyseal width growth is more dramatic than with osteophytes and people have not reported decreases in mobility or pain as reported with bony spurs. Also, there have been no reported long term signs of inflammation from LSJL(people have not reported redness, swelling, or pain). The sensations of performing joint loading usually go away after 30 seconds. Understanding osteophytes will help us understand bone growth to a greater degree and will help us eliminate osteophytes as a potential cause of joint width increase. If we can find that endochondral ossification is the cause of the epiphyseal width increase then we are very close to finding a definitive way to grow taller. "Participation in sports that cause minimal joint impact and torsional loading[rotational strain] by people with normal joints and neuromuscular function may cause osteophyte formation, but it has minimal, if any, effect on the risk of osteoarthritis. In contrast, participation in sports that subject joints to high levels of impact and torsional loading increases the risk of injury-induced joint degeneration. People with abnormal joint anatomy or alignment, previous joint injury or surgery, osteoarthritis, joint instability, articular surface incongruity or dysplasia, disturbances of joint or muscle innervation, or inadequate muscle strength have increased risk of joint damage during participation in athletics." "In a series of investigations of the effects of running without added weight, the results depended on the distance the dogs ran. Moderate running (4 km/d, 5 days a week for 40 weeks) increased cartilage thickness, proteoglycan content, and indentation stiffness. More strenuous running (20 km/d, 5 days a week for 15 weeks) decreased cartilage thickness and proteoglycan content. Longer-term strenuous running (40 km/d for as long as 1 year) decreased cartilage proteoglycan concentration and indentation stiffness and stimulated remodeling of subchondral bone"<-remember that running does not allow for cartilage to replenish proteoglycan content that may be more the cause of the cartilage damage than the load running puts on the joints. Lateral Joint Loading only loads for 30 seconds to 5 minutes. "repetitive impact loading is more likely to cause joint degeneration than increased joint use. "<-LSJL involves no impact. Idiopathic chondrolysis of the hip. Chondrolysis refers to death of chondrocytes usually in the joint. "The cases of nine patients (eleven hips) with idiopathic chondrolysis of the hip were studied. Seven of the patients were white and two were Hispanic. The age at onset ranged from eight to sixteen years (mean, 11.5 years). Four patients were boys and five were girls. All patients had a decreased passive range of motion of the hip, and radiographic examination showed regional osteoporosis, premature closure of the femoral capital physis, narrowing of the joint space, and lateral overgrowth of the femoral head on the neck. All laboratory examinations were negative for evidence of infection or rheumatoid arthritis. An arthrotomy was done in seven patients. Specimens of the synovial tissue showed no growth on culture, and the histological studies revealed only minimum signs of inflammation[inflammation may not be a prerequisite to bone spurs but rather lack of cartilage may be, the new bone growth does not seem to be derived from synovial tissue] . 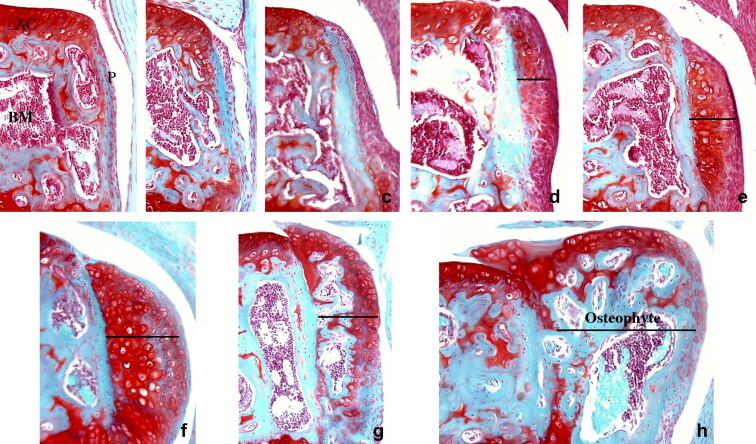 Histological studies of the articular cartilage were normal. Treatment consisted of administration of acetylsalicylic acid in therapeutic dosages to maintain a blood salicylate level of fifteen to twenty-five milligrams per cent, active non-loading exercise of the hip, protected weight-bearing with crutches, short-term traction to overcome or relieve contractures after biopsy, iliopsoas tenotomy or lengthening in three patients, and an adductor myotomy in one patient. At follow-up, 2.3 to 9.4 years after onset (mean, 6.2 years), six patients had either no symptoms or only minor intermittent discomfort in the hip. On radiographic examination, although these six patients had restoration of the joint space they did have lateral overgrowth of the femoral head (lateral buttressing) and overgrowth of the lateral acetabular margin (lateral osteophyte). In three patients who had disabling pain, joint deterioration was evident on the radiographic examination. One of these patients had a resurfacing arthroplasty to relieve pain." In the study there are reports of significant bone overgrowth. However, this overgrowth is not due to a proliferation of bone spurs. However, increase in joint width was reported in cases even when physes were closed(however, growth plates are three dimensional so there could still be open regions of the growth plate not detectable on an X-ray). And the children were followed for a long time thus there physes could have been open earlier. It's very promising that LSJL can cause overgrowth similar to that noted in developing children. There's no indication that the increase in joint width could be a cause of pain or joint debilitation. What is the effect of physical activity on the knee joint? A systematic review. "We found that the relationships between physical activity and individual joint structures at the knee differ. There was strong evidence for a positive association between physical activity and tibiofemoral osteophytes[osteophyte formation on the articulation connecting the femur and tibia so at the joint area]. However, we also found strong evidence for the absence of a relationship between physical activity and joint space narrowing, a surrogate method of assessing cartilage. Moreover, there was limited evidence from magnetic resonance imaging studies for a positive relationship between physical activity and cartilage volume and strong evidence for an inverse relationship between physical activity and cartilage defects. This systematic review found that knee structures are affected differently by physical activity. Although physical activity is associated with an increase in radiographic osteophytes, there was no related increase in joint space narrowing, rather emerging evidence of an associated increase in cartilage volume and decrease in cartilage defects on magnetic resonance imaging. Given that optimizing cartilage health is important in preventing osteoarthritis, these findings indicate that physical activity is beneficial, rather than detrimental, to joint health." There is not a perfect relation between exercise and LSJL as LSJL increases hydrostatic pressure whereas exercise has more impact with lower levels of pressure. Exercise in general causes osteophytes but without causing cartilage or bone defects. "these results suggest that osteophytes are a functional adaption to mechanical stimuli"
"Although osteophytes, bony outgrowths covered by fibrocartilage, are highly associated with cartilage damage, there is also evidence to suggest that osteophytes can develop without explicit injury to cartilage"<-osteophytes are not necessarily an indication of cartilage damage. Osteophyte formation is an integral component of OA pathogenesis and understanding the biology of osteophyte formation can give insights in the disturbed homeostasis in OA joints." "Three types of osteophytes are known, the traction spur at the insertion of tendons and ligaments, the inflammatory spur, represented by the syndesmophyte at the insertion of ligaments and tendons to bone as can be seen in ankylosing spondylitis; and the genuine osteophyte or osteochondrophyte (chondro-osteophyte) arising in the periosteum overlying the bone at the junction between cartilage and bone. "<-the genuine osteophyte derived from the periosteum may not be a bad thing and may be a functional adaptation to exercise and possibly joint loading. The increase in joint width may be due to osteophytes and not joint loading. However, osteophytes are usually smaller and the osteophytes would have to be periosteum derived. We can't be sure if this is the case. "Can the development of an osteophyte be considered as an adaptation of a joint to instability or as a result of an altered internal joint milieu resulting in chondrogenesis of precursor cells in the periosteum and synovial lining? "<-if the answer to the latter question is yes that would be very promising to height growth although a previous study showed no signs of synovial tissue growth on culture. "Osteophytes develop in diarthodial joints. Diarthrodial joints are constrained by a ligamentous structure called the joint capsule. Synovium is a membrane containing macrophages and fibroblast-like cells that cover all the non-cartilaginous surfaces within the capsule. The synovium is separated from the capsule by the subsynovial layer that contains blood vessels and nerves[these blood vessels may contain stem cells that have differentiation potential]. Synovium also covers the periosteum positioned on the outside of the cortical bone in the joint. The periosteum and synovial lining contain cells involved in osteophyte formation." "Cells in the periosteum covering the bone at the cartilage and bone boundary are stimulated to proliferate. Cells inside the developing osteophyte undergo chondrogenesis and deposit matrix molecules, such as aggrecan, in the tissue. The osteophyte remains covered with a layer of fibroblast-like cells during development. Cells in this layer contribute to the growth of the osteophyte by proliferation and differentiation to chondrocytes inside this layer. The most central chondrocytes further differentiate and hypertrophy. Hypertrophy of the chondrocytes is followed by endochondral ossification, deposition of bone and formation of marrow cavities. A fully developed osteophyte is integrated with the original subchondral bone and still shows a outer fibrous layer[So it's a part of the bone]. The top of the osteophyte is covered with cartilage expanding the original cartilage surface of the joint" <-so an osteophyte itself is a product of endochondral ossification proving that even if the joint growth is due to endochondral ossification, LSJL still causes endochondral ossification. Since there is no periosteum lining the longitudinal ends of the bone it's logical that osteophytes do not occur on the longitudinal ends of bones but in the picture you can see that the osteophyte slightly increased the overall bone height. "cell populations from the synovium can be triggered to form cartilage in vitro and synovium-derived MSC have been shown to be even more efficient in cartilage formation than bone marrow-derived MSC"<-so even without access to periosteum it's possibly to induce endochondral ossification in the bone marrow cavity.
" Transforming growth factor β has been shown to be expressed by human osteophytes"
"Studies have indicated that cartilage can be formed by periosteum even in paralyzed limbs and immobilized joints[although an increase in hydrostatic pressure can be noted in immobilized joints]. This demonstrates that mechanical factors are not indispensable in the process of chondrogenesis but does not proof that the initiation of osteophyte formation is independent of mechanical factors. Most likely mechanical stimuli that are transcribed to biochemical factors on a cellular level or autonomous biochemical stimuli initiate the process of chondrogenesis in residing MSC." "Oxygen tension and dynamic fluid pressure have been shown to effect chondrogenesis. Chondrogenesis appears to be, somewhat surprisingly, maximal at oxygen levels of 12–15% and no significant differences were observed in a range between 12 and 45%. Only at very high (90%) and very low (1–5%) oxygen concentrations chondrogenesis was impaired. The actual oxygen levels in the joint are in the low range. Although in vivo chondrogenesis during osteophyte formation takes place at relatively low oxygen levels these levels do not appear to stimulate this process. Dynamic fluid pressure was applied to periosteal explants grown in agarose. Low levels of dynamic fluid pressure enhanced chondrogenesis while high levels totally blocked this process. The authors did not use TGFβ in their culture system to induce chondrogenesis so the observed chondrogenesis was a result of the applied pressure. The applied pressure can have a direct effect on the cellular differentiation, induce chondrogenesis-promoting growth factors or modulate growth factor binding to the cells. "<-fluid pressure like that induced by LSJL may cause osteophyte formation as it can cause chondrogenesis. Osteophyte formation is not necessarily a bad thing and osteophytes can be incorporated directly into bone. Osteophytes are already encouraged by any physical activity they just form more slowly than with LSJL which applies more pressure directly to the joint. Fluid pressure can cause chondrogenesis and chondrogenesis can occur directly in synovial tissue so bone can increase in width even if not directly connected to the periosteum. Therefore, it is likely that LSJL causes osteophyte formation which results in the large increase in joint width noted by some LSJL experimenters. This does not preclude the possibility of endochondral ossification within the bone and means that growth factors that can cause adult chondrogenesis like TGF-Beta are working properly. The synovial capsule is much more easily compressible than bone and thus is likely to experience more hydrostatic pressure during joint loading. Thus osteophyte formation is likely to occur at a greater degree than endochondral ossification in length. Since Synovium derived stem cells show more chondrogenic potential than bone marrow derived stem cells. It is likely that a greater amount of stimulus is needed to induce differentiation of bone marrow stem cells into chondrocytes. This does show however that LSJL is effective in upregulating TGF-Beta and increasing fluid pressure. More may be needed to induce longitudinal bone growth however. I enjoyed this blog post. I believe we are coming to common ground. I wish to apologize for being rather... cross on the LSJL forums. I simply could see no way the LSJL could increase joint width, much less bone length. Now it appears that the only thing that would, osteophytes, actually occur because of LSJL. First off, I am quite happy about the possibility of the osteophytes being beneficial to the joint. I was under the assumption of my colleagues that all osteophyte formation is a bad thing, a result of damaged articular cartilage. Apparently we were off mark, and osteophytes may be beneficial. This raises quite a few questions however. The first, is would these osteophytes be resorbed over time?Subcutaneous injection of PGE2 stimulates a massive increase in diaphyseal bone diameter - only to be resorbed over the next year as the bone remodels back to it's original shape. I actually suspect that osteophytes will be a bit different - after all, they are the result of endochondral ossification, a bit more permanent of a process than periosteal apposition. The second question is quite obvious, and the one we are quite focused on: does the increase in joint width from LSJL result from osteophyte formation? Why I have quite an inkling it does (not a bad thing), I wonder why an LSJL-widened joint does not look like a typical osteophyte-studded joint. The LSJL-widened joint appears to have maintained most of it's original shape, while osteophyte studded joints appear to bulge out mid-epiphysis and then are normal on proximal and distal ends. Have your joints increased in size? Does it appear to resemble an osteophyte-studded joint (i.e. finger joints are now more oval than circular)? I guess the problem now is, how could we direct these osteophytes to form at the ends of the bones, rather than the sides of the epiphysises? Any ideas? I will work with a few guys in our lab when I have free time. Thank you for this worthful article! I've got a question. What pressure (in numbers) do you (tyler) use for your epiphysis? Is there any tool to messure pressure ... This could help a lot of us: probably the most of us use an ineffective amount of pressure for loading. I've been doing LSJL for 7 months, and I've noticed an increase of 5/16 - 6/16 inches. I think LSJL works but much slower than you thought. "will osteophytes be absorbed over time..."
So does that mean that our gains might not be permanent? Hey Boba, sorry for not answering your questions but they appear to be more rhetorical in nature. Answers like will osteophytes be absorbed over time will become clearer as we undertake more research. You can decide how my joints have increased or not based on the finger videos. Annonymous #1: I wish I know how to measure pressure. The best tool available seems to be a pressure gauge.